With it being National Data Privacy Day, and as a follow up to our last blog on Canadian Data Privacy, we’ll be going over a few of the ways that cloud providers can make a difference when it comes to protecting your data. While the security of the cloud has been an ongoing debate, with the services, support and management that cloud providers bring to the table, any potential risks can be avoided or significantly diminished. Some of these security benefits are multifactor authentication, convenient support and protection, patch management and the reduction of errors. A key aspect of ensuring that data is secure is employing the appropriate authentications, one of the top forms being that of multiple mechanisms. These multiple mechanisms can include a username and password, a username and API key or an authentication token. However, businesses on the smaller side may find it difficult to allocate time and relevantly skilled resources to such an undertaking. A cloud provider, on the other hand, is more than prepared to implement multifactor authentication. At VEXXHOST we employ OpenStack’s Keystone as our identity authentication service in order to give you peace of mind when it comes to the security and privacy of your data. Our reliable and user-friendly identity authentication service is ideal for authentication, policy management, and catalogue services. When employing a cloud provider, you can benefit from a multitude of their support services and protection, both physically and technologically. Support wise, cloud providers can not only ensure that you and your company are complying with any applicable regulations but also provide around the clock live monitoring. This is true with VEXXHOST as our full, actionable monitoring not only makes use of preventative measures but creates diligent system reports every 5 minutes. Additionally, as a proudly Canadian company, VEXXHOST complies with Canada’s strict data privacy rules and regulations, ensuring that we not only provide top-tier data privacy for Canadian’s but enabling us to serve those within the EU as well. For physical security, cloud providers are in a position where they can employ more robust security measures at their facilities than feasible for businesses themselves. This also makes it possible for providers to have substantial disaster recovery plans, spanning from user errors to natural disasters. Combined, the protection and support services from cloud providers can increase your uptime, ensure you’re less vulnerable to security breaches and give you peace of mind. Another effective form of cloud security is patch management. This involves installing and managing code changes or patches across all systems in a given network. However, these patches can be a laborious task for businesses to tend to as they require an application to software that is used daily, in addition to extensive testing to confirm that the patching was successful. With a cloud offering, not only is patch management possible, but there’s also the ability to scan for missing patches, ensuring that the system is up to date and that any security vulnerabilities are rectified. When it comes to the cloud, automation translates into fewer errors. For example, Heat, VEXXHOST’s cloud orchestration solution powered by OpenStack allows you to quickly deploy duplicates of existing environments by using fully configurable templates. By automating your deployment methods, this eliminates a lot of opportunity for human error resulting in unerring servers every time and more secure data as a consequence. The methods and technologies surrounding cloud security are continually advancing, however, there are quite a few existing advantages, particularly where cloud providers are concerned. Cloud providers are perfectly set up to provide you with multiple authentication mechanisms, around the clock monitoring and support, patch management and the automation of tasks as a means of reducing human error. With the legislation governing data privacy, VEXXHOST understands the burden you and your company could be facing in ensuring those requirements are met. 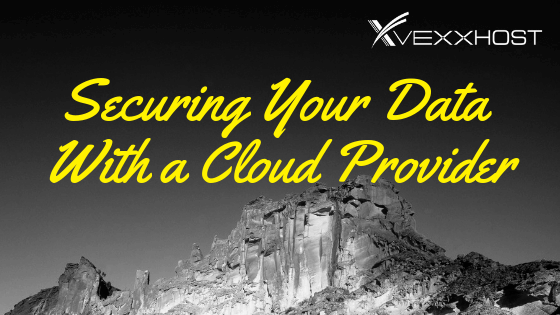 However, when signing on with an experienced cloud provider such as VEXXHOST, you’re gaining a partner that has all the infrastructure and computing solutions to not only protect your data but to set you and your company up for success. Contact us for more information!